The army rolled out its trophy hardware for the bicentennial parade Sept. 19, including the recently added Leopard II tanks, Marder infantry fighting vehicles and M-109 self-propelled guns. It was the first time that the annual armed forces parade exhibits armor since Gen. Augusto Pinochet's final parade. More interesting are the pictures of the army's small arms (which get little attention in the press) that are showing up on Chilean bulletin boards. One board shows the Mini-Hecate .338, a sniper rifle made in France, the AT-4 shoulder fired antitank weapon and the M-4 Panther carbine. The Mini-Hecate (at right), also known as the PGM .338, has a range of 1,400 meters. 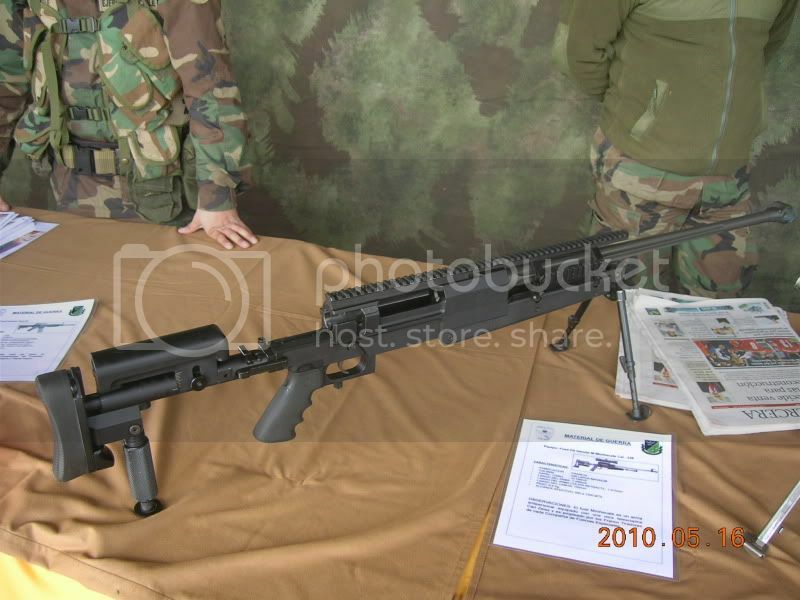 It is a bolt-action rifle, as most sniper rifles are. Chile's air force is evaluating three options for a new airborne early warning system (AEW), according to a report in Enfoque Estrategico. All three involve turboprop platforms: the Grumman E-2C Hawkeye, the SAAB 2000 AEW&C and a third alternative that would incorporate SAAB's ERIEYE airborne radar to C-295 aircraft made by Airbus. The air force is seeking to replace its lone Condor AEW airplane, a Phalcon system built by Israeli Aerospace Industries and Elta Electronics on a Boeing 707 platform. The report echoes chatter about an AEW acquisition. Enfoque Estrategico, by the way, is probably the most valuable Web site for South American military news. After years of sluggish business, the air force's aerospace company is landing some big contracts. Enaer signed a $100 million, 10-year contract in August to provide parts for Embraer's Phenom and Legacy business jets. Enaer later won a contract worth up to $700 million over 10 years when it joined a strategic alliance with Embraer to develop and build the new KC-390 transport-tanker. The deals should help Enaer (owned and managed by FACH) emerge from its long slump. It should also result in an order by Chile's air force for about a half-dozen planes. The company last year booked a mere $35 million in sales as it got by on its core aircraft-maintenance business and some aircraft parts. Meanwhile, the company landed a contract to repair Uruguay's C-130 Hercules planes, and in March was authorized to upgrade equipment in the Chilean air force's F-16 fighters. Enaer is also trying to revive its Pillan basic trainer program. The manufacturer has unveiled plans for a new model with all-digital displays.